We're crazy about these energy bites! 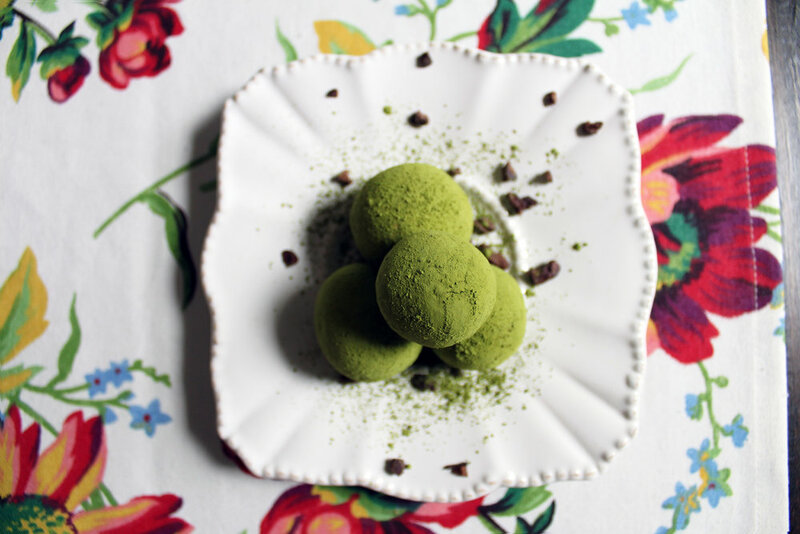 Both matcha and cacao are super high in antioxidants. Antioxidants keep your skin fresh and glowing, help detox your body, and slow down signs of aging. Pair that with cacao's mood-boosting, energy-giving qualities, and we have a winner on our hands! We made these and kept half in our freezer (for a dessert kind of feel) and half in our refrigerator (for an on-the-go snack). They were SUPER easy to make and we hope you love them as much as we do!! 1. Blend dates, almonds, and cacao in food processor until fully mixed. If your texture is not soft, you can add more of your favorite nut butter! 2. Roll into 10-14 balls depending on preferred size. 3. Roll the balls in matcha! 4. Refrigerate (or freeze!) and enjoy! All but the Oxo Brite is available at Kroger which I ordered through Amazon. Grate the bars of soap (I used a hand grater which was a pain. Other people use a food processor and say it is much easier- I'll probably do that next time). Then mix all the ingredients together!! Use 1-2 tablespoons per load. I have a HE washer and just put it in the powder section. I store mine in a large glass container I got at Target. Hope this is a helpful solution for everyone! This is a follow up to my introductory post about flower essences, which you can read here! Suppressed formulas can cause an emotional ‘detox’ in some people. The first few days, you may feel more sad or frustrated, feel like crying, or feel fearful, but after 2 or 3 days you should experience more balance. Working with these formulas can be hard at first because tons of emotions might suddenly arise out of nowhere, but the emotional balance and calm energy after being on them for a few days is amazing. When I started using the suppressed fear formula (Be Response-Able), all these deep inner fears popped up at the weirdest times of day, even though they were completely unrelated to my life at the time. My husband didn’t know what was going on, and neither did I, until I connected the dots: it was Be Response-Able! Moral of the story—the first few days might be super emotional. I wouldn’t recommend starting flower essences on an important day at work or school. These are great to start on the weekend or when you have some down time. It is important to stay on these consistently. If you use them for three days, then forget to take them for a few days, then start again, it can cause a ‘emotional detox’ each time. So make sure to be consistent! Anyways....I wanted to give a brief introduction to our formulas designed for people who tend to suppress emotions! Find Strength is designed to help people find their inner voice and strength. It can help those who feel unworthy of a situation, job, relationship, etc... or those who have trouble standing up for themselves. It is great for chronic people pleasers, and helpful for those who have trouble allowing themselves to feel anger. From my experience with patients, people who need Find Strength tend to have mild anxiety that greatly heightens in the evening or before going to bed, when life quiets down and there isn’t as much to distract them. This formula is great for those who are emotionally shut down (aka people who have trouble with compassion, empathy, or even the ability to love). This can be directed at a certain person, situation or even themselves. They can have closed off hearts from past situations and have difficulty trusting others and being vulnerable. In my experience, patients who need Open Heart tend to be closed off during appointments. In rarer instances, people who are externally happy test very well for Open Heart because they love other people, but cannot seem to love themselves. Recently, many patients who tested well for Open Heart have had trouble loving and trusting themselves because of a childhood trauma or past experience they believe they could’ve prevented (which is not the case at all). This one can have an intense ‘detox’ phase. The first few days may feel more depressive and dark (not in everyone), but it truly helps people open their hearts and find love and compassion towards themselves and others. This formula is great for overly responsible patients-- list makers, those with OCD tendencies, and people who beat themselves up over things that are out of their control. It helps people realize their fears. It helps them understand what emotional issues are driving their compulsions, perfectionist tendencies and/or self-defeating behaviors. This is the formula for which my body has a strong, positive reaction. I tend to be very tidy, like things in their place, even OCD you may say (shocked?!). I beat myself up when I don’t get everything done...even though I could never finish everything on my to-do list, anyways. When starting, be prepared for fears to pop up that you didn’t know were hidden… I know this from personal experience! Listen to your thoughts, try to process what you are feeling, and by that 3rd or 4th day, you should feel much better and more balanced. Why would we want to use these if we feel like we are doing okay pushing it all down? Our body, both physical and mentally, has to find detours around everything we supress and push down. After weeks, months, and years we become run down, exhausted and emotionally drained and don't even know why. So these formulas help us process, heal and move forward and eliminating all those exhausting detours it had to make to get by! If you want to try out flower essences, come by the office! I will be sharing about our vented formulas soon! It's that time of year where we all want our feet to look our best. If you a truggle to wear sandals in the summer time because of athlete’s feet, try this! My dad had it severely and this has been a miracle! Soak your feet in a 1:1 ratio of warm water and apple cider vinegar for 15 minutes a day. You should notice a change within a couple days- but it may take some people up to 10 to see a difference. After you have soaked them lather coconut oil all over your feet and let it soak in! This soak is also great for those who have smelly feet and you can even add ½ to 1 cup baking soda. Apple cider vinegar is amazing because it has antifungal, bacterial and viral properties. It is great for your immune system and digestion if you drink a TBS or 2 daily and you can use it topically for soaks to help heal up infections and get rid of nasty fungal infections- like athlete’s foot or toenail infections too! Try it for daily for a couple weeks and see the change for yourself! Fats are your friend. Sugar is not. I probably say this on a daily basis. If you've been on social media, you've probably seen or read the articles about coconut oil and how it's actually not healthy for you. It's caused quite a stir! Here is my take on the coconut oil debate. Some of the sickest and most fatigued people I see are those who have been put on cholesterol lowering drugs - they walk around with joint aches and pains (some move around like they are twice their age), they have severely low energy, poor memory and feel awful. But good news, their cholesterol is low (some even below 100—which is NOT good at all.) AHHH! It is all a misconception in my opinion. Aside from trans fat (which is vegetable oil that has been hydrogenated), fats are your friend! The links the article sites aren’t even linked to increased heart disease. They are linked to increased cholesterol levels which aren’t really a predictor for heart disease/strokes- you need to look at triglyceride levels and sugar handling (insulin), as well as CRP on blood work- those are MUCH better predictors. Additionally, there was a large study in 2010 that stated that increased saturated fat intake didn’t increase cardiovascular disease. IF (which I don’t believe is the case) saturated fats were really the issue, this article assumes that all saturated fats are the same. Not true at all! Coconut oil is 2/3 MCT (medium chain triglycerides). MCT’s are used for energy and not stored as fat. If you want more detailed description on the breakdown of that you should read this article. In my opinion the issues lie with sugar, grain and flour consumption. I don’t panic if cholesterol or LDL is elevated (unless it is SEVERELY high), I but look especially closely at triglyceride levels, insulin and CRP. If any of these are slightly high that is when there is a red flag for me. It actually reflects sugar/flour/grain intake and how much inflammation is in the body. I just think as a society we are focusing on the wrong blood markers for heart disease and there are many people that agree with me. Give it 10 more years and maybe the American Heart Association will come around ☺. Also, lowering fat consumption causes most people’s hunger levels to greatly increase—which leads them to sugars, carbs and processed food—which leads to inflammation (not just in the body but the arteries as well). Another major bonus on coconut oil they fail to address is its fantastic microbial properties. Caprylic acid and lauric acid found in large percentages in coconut oil which are antifungal, antibacterial and antiviral. I have seen amazing changes in people’s immune system by just adding coconut oil into their daily routine. You can’t say the same for vegetable oils at all. The immune boosting properties of coconut oil are phenomenal! PS- this is the same organization that said margarine is good for you (and they may still do). Margarine is a nasty chemical product that does more damage than any sort of good. They also say Cocoa Puffs are heart healthy… so take that for what it is worth. Don't worry, coconut oil, we're on your side. As you have probably heard us say countless times in the office, “Everything begins in the gut!” Digestion is such a huge factor in your health that we end the testing portion of every appointment by testing your digestive points to ensure that you are properly absorbing and utilizing the nutrients from your food AND the supplements you are taking to heal. Many patients also ask what they can be doing outside of the supplements and dietary changes to further their health. Two very simple products to incorporate into your daily routine are Gelatin and Collagen Hydrolysate. You may have seen them in our office and wondered what they are and how they differ. Collagen Hydrolysate is gelatin that has been further processed to breakup those proteins and amino acids. This makes is much easier to digest and is more quickly absorbed for that reason. Collagen Hydrolysate has all the same benefits of Gelatin and can even be a bit easier to use because you can put it directly in hot OR cold liquids without having to let it ‘bloom’. As an easy rule of thumb, if your purpose of consuming either of these is more GI-related-reach for the pure Gelatin. If you are looking for help with skin, nails, joints, or sleep, reach for the Collagen Hydrolysate. Start incorporating Gelatin into some of your favorite soup recipes or even jello/fruit snack recipes and start adding Collagen Hydrolysate into all of your drinks or smoothies! Did you know that plastic is a major hormone disrupter and actually mimics estrogen and interferes with our body’s own hormone signaling? This causes all sorts of hormonal issues for both men and women and can be linked back to PCOS, hormone related breast cancer, endometriosis, prostate cancer, thyroid disorders, obesity, and much more!! Just think how almost everything in your house is stored in plastic. Plastic water bottles, plastic wrap around our deli meet, cheeses, Tupperware containers for all our left overs, mixing bowls, cups, plates, toothpaste containers, juice bottles, etc. I mean the list goes on and on. You can't get away from it however you can simply change a few things that will make a big difference. 1) Stop storing left overs in plastic containers like Tupperware. Make the switch to Pyrex or glass storage containers. 2) If you have to store food in plastic containers DO NOT heat your leftovers up in it. (The microwave is problem number one but I understand that's all people have at work. Just make sure you don't heat your leftovers up in plastic or cover with plastic wrap. Heat leftovers in glass containers and cover with a paper towel.) Plastic particles (especially when heated) leak into the food. When you pour your hot leftovers into a plastic storage container or heat them up in plastic those particles seep into the food. You won’t taste it but that doesn't mean it doesn't do any harm. At our office I bought a hot plate where we can heat up food or keep things warm (great for keeping your tea/coffee warm too). It takes time to heat the food up and doesn't zap anything to make it hot in 30 seconds (which is a good thing)! (Add coconut oil if appropriate to keep things from sticking. Plus you get your coconut oil in for the day!). I know most of you won't be able to bring this to work with you but it’s an idea! Ours cost maybe $20 from Target. 3) Get glass reusable water bottles. Ditch the plastic bottles. No one is perfect and I am not claiming to be. I still drink out of them if I forget my water bottle but I make a conscious effort to keep it minimal. 5) Get glass mixing bowls. This is especially important for when you make or pour hot ingredients into them. Remember when food is hot the plastic leaches into the food easily.